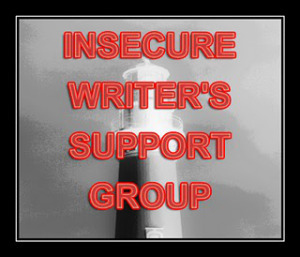 Well it is the first Wednesday of the month, so that must mean that it is officially the Insecure Writer’s Support Group Day. For those of you not in the know, Alex J. Cavanaugh created this wonderful community of writers in order “To share and encourage. Writers can express doubts and concerns without fear of appearing foolish or weak. Those who have been through the fire can offer assistance and guidance. It’s a safe haven for insecure writers of all kinds!” It really is a wonderful community of writers, and I highly recommend you go Alex’s site and check out some of the links. Writers more often than not welcome new readership. It serves to boost our little egos. There are moments throughout my day, particularly when I’m tired, when my mind wonders every which way but here. I will be on my phone going back and forth surfing through the same five or six sites obsessively, knowing full well that I had visited the site just 20 minutes earlier and that the likelihood of the site being updated with any new content where probably slim to none. Yet I will repeatedly check back in hope that something, anything new, might be found that will spark my interest. That my mind will find something that it can home in on and stay fixated on for longer than a few minutes. My thoughts jump from subject to subject. Worry to worry. From one day dream to the next. This fragmented state of mind is amplified even more so when I’m at work, due to the repetitive and tedious nature of the job. There isn’t a whole lot of opportunity to think outside the box doing my job. There is little to no chance of using whatever ounce of creativity that one possesses and apply it any meaningful way to any of the menial tasks that I’m stuck doing for ten hours a day. I try to focus. I try to concentrate at the mundane task at hand, but as much as I try, as much as I try to ignore all the constant chatter of my inner voice, I fail. I don’t have the energy to keep my thoughts at bay. The only time I can quiet my inner monologue, the only time I can keep out all the outside distraction, is when I’m at home by myself, with the dogs laying on our bed angry that I’m ignoring them, while I’m sitting in front of the computer, listening to some soft tunes, writing down what are little fragments of myself for the blog. When I’m writing something pretty amazing happens to my mind. All that persistent chatter that under any other circumstances would be continuous, just cease to be. My train of thought becomes focused. The voice that I’ve always wanted to speak with, but never could because it’s been stuck hidden away by a mind that moves much faster than the tongue I was born with, is finally given full reign to articulate in a way that does not make me feel half-witted. So many folks like me are so hard pressed to find the courage to open their mouths to speak their mind if they had not have had a chance to rehearse exactly what they wanted to say, or risk stumbling through their words awkwardly. This fear kills off any chance of being able to enjoy a moment of spontaneity. Which is where some of life’s greatest moments are born. Writing liberates me. It makes me feel whole. Time slows down and it allows things that were hidden behind a fuzzy haze of doubt, became clear and focused. It puts me in touch with feelings that I did not know where there. It makes me realize how much I love being alive. Writing is a solitary endeavor. When I write, I become detached from the world. As if I no longer belong to it. I become almost a ghost, someone living outside this plane of existence. Observing a world that hardly notices me anyway. I like to open the shades in our computer room, and let some light come through through. I’ll take a few moments to become a casual observer. I will see a couples walking by, sometimes with grocery bags, other times walking their dogs, and I will wonder to myself what is their story. How did they meet? Have they been together long? What stormy patches have their relationship survived through? Is there still love in their hearts for each other? Or are they simply together only because they are trying to uphold some standard that society had forced upon them long before they were ever born? From my window I spot kids walking to and from school. Sometimes they are being accompanied by their parents. Other times they are alone alone. I ponder what kind of lives do their parents and guardians give them? I ask myself which one of those kids find themselves dealing with the kinds of issues I grew with? How will they cope with trying to survive their ordeal? Which of these kids are growing up in a stable loving home, where their parents go to bed thanking God that their kids where brought into their lives? Which parents don’t take their children for granted, and vice versa? I wonder to myself what course will their lives take them? What sort of impact with their decisions will have on the world, not only in the near future, but centuries down the line, when they are nothing more than particles floating in the air. When I sit down to write my mind expands and all possibilities become endless. It is truly a magical feeling. I only wish it was something I could do more often. It’s hard to fit in the time while working long hours, and trying to live the life of a responsible adult. But right now I will take what I can get. Because when I sit down to write these little rants, it feels like I’m finally learning how to speak. Isn’t that feeling wonderful? When you detach from the minutia of everyday life and enter the world of your characters. It is freeing. Best wishes on your writing. I like being a ghost. Right now I am a ghost with a kitten perched on my shoulder. But she is not the kitten that jumps down on the keys. I have autism. I have all the symptoms of AD/HD but it doesn’t count because I have autism. And autism rules. Or something. Writing helps. Even though I never finish my novels. So I must start writing more poetry. WIth explosions in it. If there is something that there isn’t enough of, that would be poetry with explosions in it. So I highly encourage you to write some. When I do my ghost thing, I get to be one with my two dogs. Only that they go out of their way to remind me that they can see me just fine. And writing does help. Sometimes writing one thoughts down is how we keep sane.